An estimated 10 to 15 percent of the worldwide population suffers from irritable bowel syndrome (IBS), a chronic digestive disorder of the large intestine that causes abdominal pain, diarrhea, constipation, or alternating episodes of both. These symptoms are the result of abnormal intestinal motility –– too fast leads to diarrhea, too slow to constipation –– and increased sensitivity to pain. Bloating, gassiness, bowel urgency, and mucus in the stool are also common in IBS. Despite its prevalence, the exact cause of IBS is still unknown, and we don’t have diagnostic tests for it like we do for celiac disease and inflammatory bowel disease. Still, there has never been more interest in understanding and treating this complex disorder. 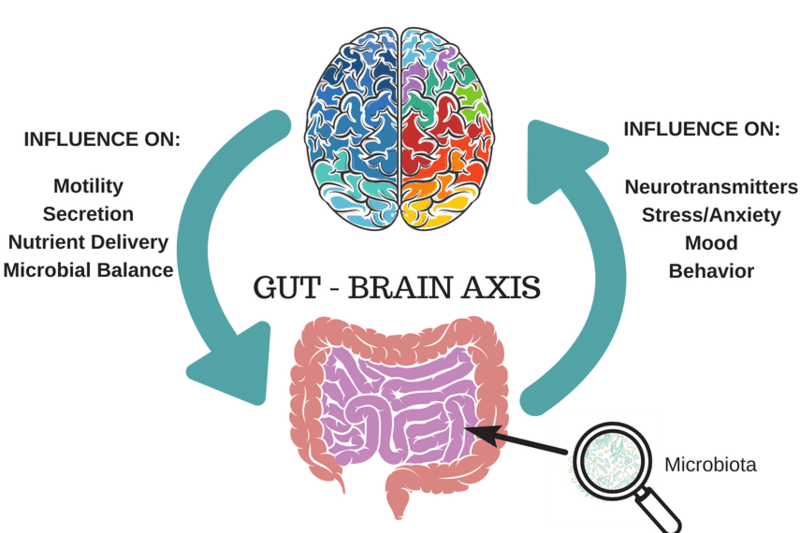 The most promising area of IBS research concerns the “gut-brain axis,” which is a shorthand term for the way the brain and gastrointestinal tract communicate. If you’ve ever had “butterflies in your stomach” or an urgent need for the bathroom before an exciting or upsetting event you’ve experienced the gut-brain axis in action. The important thing to understand is that gut-brain axis is a two-way street, with the brain influencing how the gut functions and the gut modulating how the brain functions. Researchers suspect that disruptions in this pathway cause the intestinal motility problems and increased sensitivity that lead to classic IBS symptoms of diarrhea, constipation, and pain. Furthermore, they suggest that gut bacteria –– the gut microbiome –– play a big part in causing brain and gastrointestinal tract to miscommunicate in the first place. It’s very frustrating to hear that the cause, much less the cure, for such a common condition is still unknown, but we do have more ways of treating IBS than ever before. These interventions generally fall into three categories: dietary, pharmaceutical, and psychological. The premier dietary approach for IBS –– the low FODMAP diet –– has been shown to provide significant symptom relief in 75 percent of people who try it. That’s a remarkable statistic. It’s also why our goal at FODMAP Everyday® is to help you understand and incorporate the low FODMAP diet into your everyday life. You can read more about the diet here, and then start putting it into practice with our delicious low FODMAP diet recipes. Medications for IBS are *numerous but they often target only one of the predominant symptoms which is problematic if you suffer from two or more. Another drawback to using drugs for IBS is the potential for side effects. The most well researched psychological interventions for IBS are cognitive behavioral therapy (CBT) and gut-directed hypnosis. These are particularly helpful for people whose symptoms are exacerbated by stress. Both CBT and gut-directed hypnosis have success rates that surpass many medications but they also require a greater time and emotional commitment.